Dubsado is an all-in-one business management tool where you can handle your entire client process. You can send contracts, quotes, invoices, questionnaires, handle project management, bookkeeping and MORE! In this bonus course, I’ll show you exactly how to set up Dubsado and make it work for your design business in just one day. 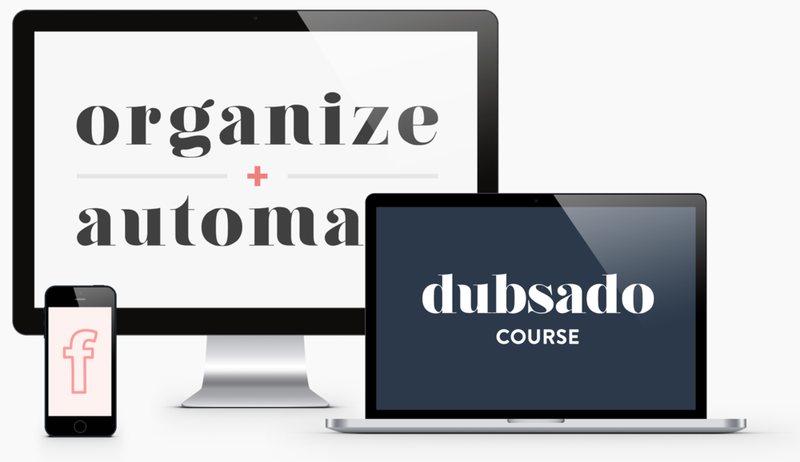 Unlike the free tools featured in Organize & Automate, Dubsado is $25 per month. If you have the budget for it, I highly recommend using it. Enroll today & you'll automatically receive this bonus as soon as it's released on May 18th. Sure, you can get through some courses without a community. But a course about getting organized isn’t one of them. You’re going to want a place where you can ask questions and quickly troubleshoot problems. In this community, you'll have access to me, my team and the other students! Sometimes, clients are calling you at weird hours, expecting you to reply to their emails ASAP, and expecting you to complete extra revisions for free. Wouldn’t it be nice to provide them with a guide that sets boundaries and expectations before the project starts? That, my friend, is called a Welcome Packet. My special guest, Erin Flynn, will teach you how to create one in this bonus workshop! Once you've used my course to organize your project process, you need to start looking for clients. This 50-page workbook will help you use six key marketing strategies to find them! In this audio lesson, you'll learn how to find the perfect virtual assistant, where to find them, what tasks to outsource and when to hire one. Nesha's business is one I hope people pay attention to in a big way. Her videos are so good. She is one talented lady and she has SO much to give this world! I had never invested in an online course before this one. I didn’t know what to expect, or whether it would be useful, or whether I would even have time to finish it. 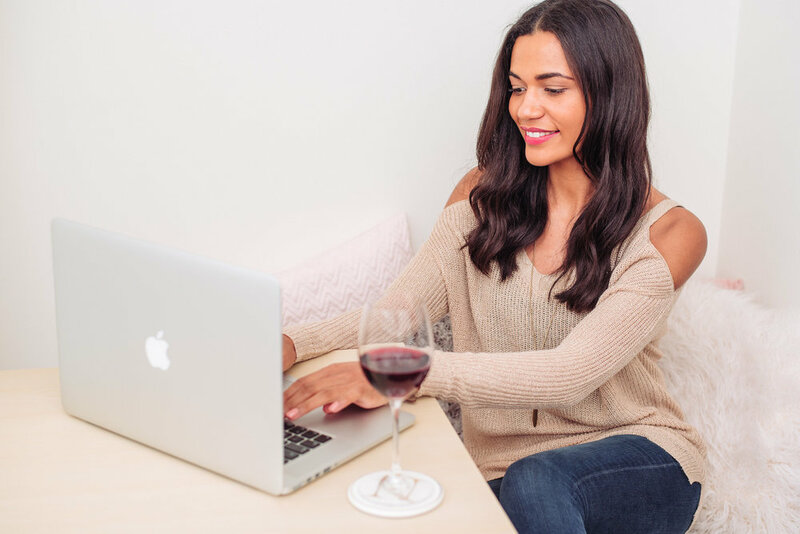 But after I invested in Organize & Automate, it got me organized really quickly so I could focus on more important tasks, like finding clients. This course has saved 5/6 hours on every client project just by helping me put a system in place instead of reinventing the wheel every time I take on a client! The first year of my business was not easy. My husband got fired, I found out I was pregnant, my sister was hospitalized for weeks and things got WORSE because my business was stressing me out too. I started looking for a day job because I thought it would be less stressful. But there’s no way I could give up my business. After taking Organize & Automate, I’m so much happier and less stressed. In fact, my income has DOUBLED because I feel more confident taking on multiple clients now that I have a clear system in place. Enroll! Do it! I don't have extra money to throw around by any means but I wanted to get serious about getting organized before I leave my 9 to 5 and I don't think I could have made a better investment to get me feeling ready. I'm now able to respond to clients faster and spend way less time on emails because I use Nesha's email scripts. Organize & Automate is freakin' fantastic. I LOVED it!! I absorbed each module like a sponge! I'm still mostly in the "finding clients" stage right now, but I know that once I begin to book clients, my process will be smooth sailing thanks to Organize & Automate! Before this course, I felt like I was crazy. I had so many projects and so many emails. I was missing deadlines because I couldn’t keep track of everything. Now, everything is easy and streamlined, my clients feel confident and validated about hiring me, and the relationship between me and my clients is so much stronger. 02. Learn from a designer who knows what she’s talking about and can take you from overwhelmed to organized in 2 weeks, not months. I was on the fence about spending the money on this course as I am just starting out with my business. I realized about 20% of the way through that it was already worth every cent! I already feel so much more efficient and professional with my process. I would definitely recommend enrolling in Organize & Automate to all designers who are struggling with their client workload. In the past, I had been hopelessly juggling clients and setting reminders on my phone but now I feel like everything is organized and I don't have to worry about anything apart from designing, which is the bit I love to do! Organize & Automate is the most practical course I have ever enrolled in! It provides value well beyond its price point. Nesha offers mockups and other resources that are truly invaluable and which have already saved me time and hassle in the early stages of starting up my freelance graphic design business. Organize & Automate is a resource I will come back to over and over again! Maybe you have too much client work to do and not enough hours in the day. Or maybe you’re trying to build your business on the side of your day job and you could use some extra help, so your business is still growing while you’re at your 9-5. In this bonus training, you’ll learn when to hire a virtual assistant, where to find one, what to outsource and why it’s a lot more affordable than you think! You're officially a student - woo hoo! Now, I know you want to get your business organized as quickly as possible and you want to take alllll the shortcuts. That's why I'm offering you one right here! In module 02 of this course, I teach you how to use a project management tool with your clients and how to create a video you can send to your clients that will train them how to use it, too! But if you don't have time to make your own video or you don't feel confident doing so, why not send them my pre-made video instead? 3 hours spare each day. Clients are becoming referral machines. Double the income in half the hours. These are just some of the results my students have had, and you can have them too. Do you sometimes wonder if it would be easier to get a day job? Work in a studio? Leave all the payment-chasing and following-up to someone else and just collect your payslip at the end of each month? Be honest. I know you sometimes think about that because I used to think about it too. despite those thoughts, you’re no quitter. This business was your dream, and there’s no way you’ll give it up without a fight, right? That’s why you’re here, reading this. You know that if you carry on down this path to burnout, your business won’t last long. Organizing your business now is the key to regaining your sanity and creating a sustainable business you’ll love running for years! • Creating digital products so you can make money while you sleep. • Hanging with your husband and kids. Organize & Automate will help get you there. Use my 7-step framework to go from overwhelmed to organized in as little as one week! You’re busy with client work and can only spare one/two hours a day for one week to organize your business. You felt like those courses were a disappointment. You’ve tried everything to get organized (and none of it has worked). I’m here to help you organize your design process once and for all, and together it will only take one week. One week to peace of mind and confidence in your process. One week to a design process that blows your client's minds and leaves them raving about you to all their friends. You haven’t made the TIME to set up systems and processes within your design business. You know you should. You know it will make running your business 100x easier. But the thought of getting organized seems like a lot of work. I know I sound crazy and hypocritical saying that, but hear me out. Start and then get distracted by something else. Set up systems but stop using them one week later. You know what I call that? Wasting time. Getting organized is supposed to save you time. It’s supposed to shave hours off your work week, not add them on! Think of the days you’ve wasted trying to get organized and failing miserably. Think of the hours you’ve spent searching for Youtube tutorials about project management tools, or scouring through Pinterest for the perfect post about organizing your inbox. With training exclusively made for web and graphic designers, you’ll be able to set up systems in your business and stick to them. Most importantly, you won’t have to waste hours experimenting with dozens of tools because Organize & Automate maps out the step-by-step framework you need to get organized fast. • Specifically teaches designers how to organize their process. It’s not a course for female entrepreneurs. It’s not for freelancers. It’s for designers. That means you’ll find help in this course that you won’t find anywhere else online. • Holds your hand through all the tech set-up. I’m not a fan of courses that tell you which tools to use, then leave you to figure out how to use them. Here, the course handles the tech for you. Just watch the tutorials and learn! • Benefits everyone, whether you’re totally new to design or you’ve been a freelance designer for years. We have students who haven’t started their businesses yet and students who have 20+ years of experience, yet they’ve all found Organize & Automate life-changingly helpful. • How to pause your inbox and manage inbox overwhelm. • How to use a CRM tool to follow up with clients. • 6 Gmail tricks to speed up your inbox workflow. + 11 Copy & paste email scripts you can use for milestones in your design projects! • How to set up client reminders in Asana. • How to communicate with clients in Asana. • How to train your clients to use Asana. • Wireframes: What they are and why you should be using them for your design projects. • Tech tutorial: How to use Wireframe CC. • Five things you should do after your client books their project. • [CHEATSHEET] 50 must-have tools for designers. • [SCRIPTS] 11 copy & paste email scripts. • [READYMADE VIDEO] Asana training video (to send to your clients). • [VIDEO SCRIPT] Asana training video script so that you can create your own. • [CHEATSHEET] Design process cheatsheet. • [CHEATSHEET] Illustrator & Photoshop keyboard shortcuts. • [PHOTOSHOP TEMPLATES] Moodboard, brand board and client presentation templates. → Get 11 copy and paste email scripts you can use at milestones throughout your design projects, so you're not always typing out the same things to every client. → Learn how to pause your inbox so emails only come in at certain times of the day. No more inbox overwhelm! → Use my favourite inbox add-on to automate the follow-up process you're not missing out on extra work by forgetting to follow up with clients. → Learn 6 Gmail hacks that will help you reply to emails faster so you can spend less time in your inbox.